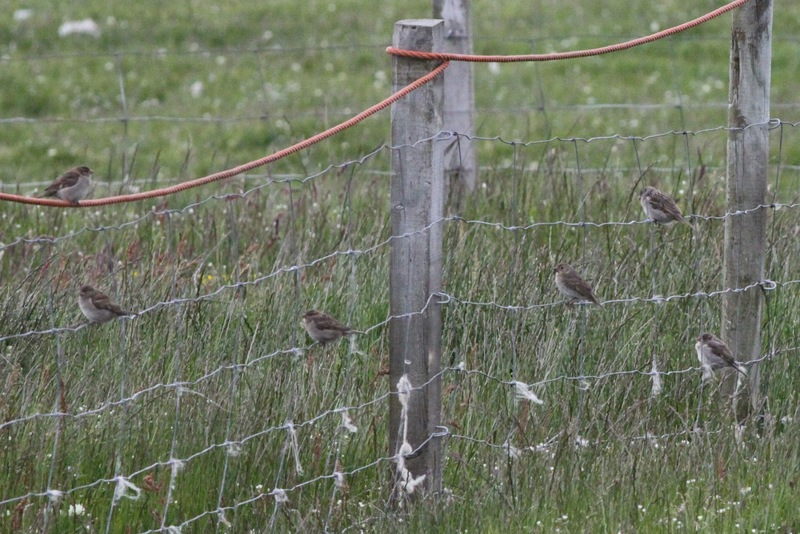 Fair Isle Bird Observatory: the Warden's diary: Leg it - it's the Rozzers! Leg it - it's the Rozzers! Sadly there were no photos taken of the Roseate Tern. 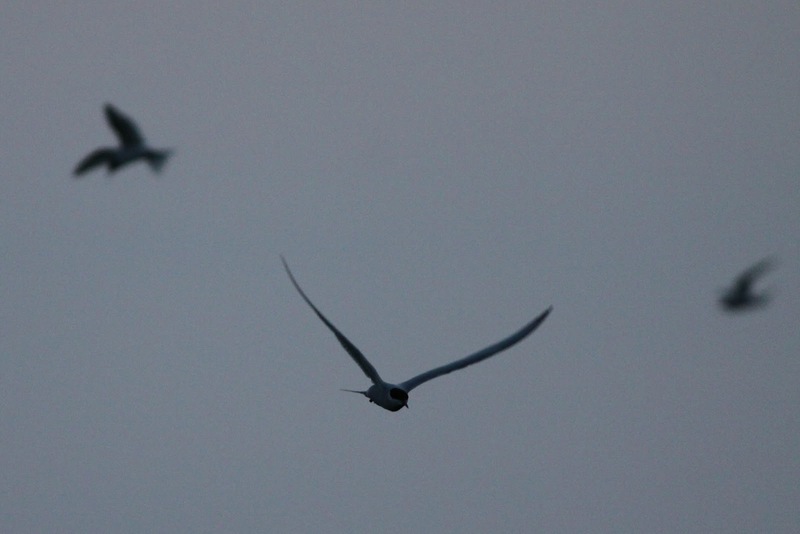 These are some of 40 or so Arctic Terns that were catching moths (mostly Map-winged Swifts it appeared) yesterday in the same area towards dusk. ﻿﻿It wasn’t the only good bird on the island today, with a lovely male ‘western’ Subalpine Warbler (I’m told it’s lovely, I’ve managed to miss it every time I’ve looked) that had been found at the Haa yesterday still present. That’s five Subalpine Warblers this year now and it has kept the spring migration going longer than we expected; it was further extended with a Common Rosefinch found at Schoolton today. 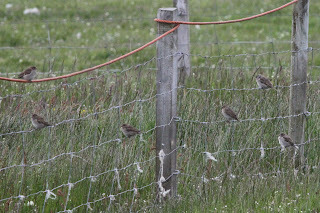 A few hirundines included at least two Sand Martins, a couple of Swallows and at least four House Martins, which included a pair nest building on cliffs on Meoness, an exciting development as they last bred on Fair Isle in 1986). The Common Rosefinch tries to disguise itself amongst the local House Sparrows, but manages to stand out by being plainer! After seemingly stalling in the last week, the Crossbill invasion picked up pace again today, with around 20 scattered around the island – Two-barred in the next few days perhaps…? There were still 2 Marsh and one Reed Warbler present today, along with several of the other birds that seem set to linger in the summer. A Grey Heron in the Gully was the first of the autumn, yesterday saw the first Green Sandpiper of the autumn as well, with other new birds including Short-eared Owl, Red-breasted Merganser and a third Woodpigeon. Fair Isle Wrens are amongst the birds to have obvious fledged youngsters now, with this one frequenting the Obs garden. 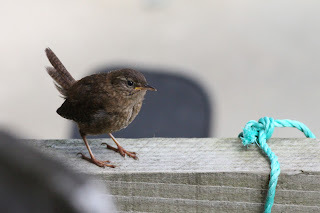 A Tern for the worse... and a Subalpine in my garden. congrats! but I'm still glad to be in Minnesota on vacation. Where is the 2-barred Crossbill? good luck with more birds, cheers!